Address : Place du Général de Gaulle. 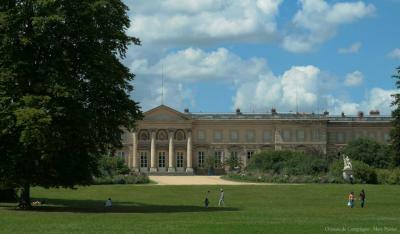 Compiègne Castle Park and Garden : Starting from J.A. Gabriel's 18th century project of a French garden, his successor, architect Berthault, created a wonderful landscape garden, marked by the influence of beginning romantics. It was at that time that was opened, at the demand of Napoleon I, the Alley of Beaux-Monts, inspired by Schönbrunn, that gave to Compiègne castle, owing to a cunning utilisation of perspectives, a natural prolongation of the forest. The rose garden was designed in 1820, next to the temperate glass house. 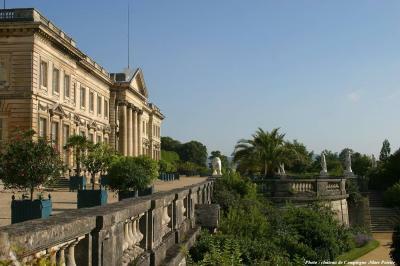 It has been restored during the last years, associating different ancient species of roses and numerous perennials. From 01/11 to 29/02 : 8 am to 5 pm. From 01/03 to 15/04 and 16/09 to 31/10 : 8 am to 6 pm. From 16/04 to 15/09 : 8 am to 7 pm. Guided visits with previous booking	, Duration of a guided visit : 1h, Minimal number of persons for a guided visit : 1	. Entry free of charge to the park. Shop, Public lavatory, Refreshment stall and sweet shop, Tearoom, Saloons to let, Concerts, Shooting of films, Dog not admitted, Carpark arranged, Museum visit, Castle visitation, Exhibition visitation.